Much has been written about the Northern Dvina, but few are aware of the cultural heritage represented by the forgotten churches and houses along the distant reaches of the river. The Northern Dvina River, from its origins at the town of Veliky Ustyug to its mouth near the port city of Arkhangelsk, is not one of the world’s major rivers in terms of size and length. However, its importance for Russia is exceptional. Indeed, in the 16th and 17th centuries, the Dvina River, which empties into the White Sea, was Russia’s main outlet to the west, to Britain and Holland. From the 16th through the 18th centuries, the entire White Sea area was linked by rivers, lakes, and the sea into one of the most powerful trading networks in Russia. The Dvina River basin, which includes the Sukhona and Vychegda Rivers, served as the major component in this system. Through the vast territory of the north - from Siberia to the Kola peninsula - moved furs, forest products, fish, and that most essential of commodities, salt. One particularly interesting area extends inland from the Dvina's right bank near its confluence with the Vychegda River, a tributary that stretches northeast toward the Ural Mountains and Siberia. This corner of the Dvina not only had abundant salt production, but also was known for its metal works. It was here that the Stroganov merchant dynasty began its major role in Russian history. 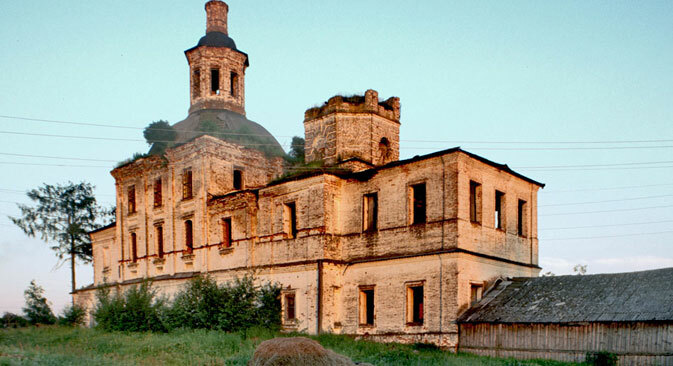 Among the region's notable historic villages is Verkhnyaya (Upper) Uftyuga, located on a dirt road along the small, winding Uftyuga River some 20 miles inland from the Dvina. The village contains one of the defining wooden monuments of the North, the Church of St. Dmitry (Demetrius of Thessaloniki), erected in 1784 and carefully restored in the late 1980s. The most striking feature of the St. Dmitry Church is its tent tower, which comprises over half the 130-foot height of the church. The eight-sided tower rises above a low octagonal log base, which in turn rests on the large cuboid basic structure. The tower culminates in a cupola covered by wooden shingles. On the east side is an extension for the apse (with the main altar) that is crowned with a small gable and cupola. The church is constructed of stout pine logs, tightly fitted and notched at the ends. Just beneath the base of the tent tower, the logs are extended in length to support a flare (poval). This extension bolsters the tower and also creates a roof overhang (politsa) that protects the lower walls from excessive moisture runoff. The flare design is both functional and at the same time one of the most graceful details of Russian wooden architecture. The powerful vertical presence of the Church of St. Dmitry is further emphasized by the lack of the usual extension for a vestibule on the west side of the church. In this case, the west façade is fronted by a simple raised gallery from which a covered stairway descends to the ground level. This elevated approach lifts the main entrance above the snow drifts that accumulate during the long winters. In every season the soaring form of the Church of St. Dmitry served as a beacon throughout the area. To the south of the Uftyuga, back country roads (often little more than sandy tracks) wind through the pine forests in the direction of Solvychegodsk. This region between the Uftyuga and Vychegda Rivers has a number of remarkable wooden houses. Many of them have been abandoned, yet they still give a sense of the rich folk traditions so characteristic of the Russian north. These large structures usually have two levels that encompass living quarters in the front and a barn for storage and livestock in the back. All components are under a long extended roof. Log houses traditionally have decorative window surrounds (nalichniki) as well as end boards (pricheliny) along the front edges of the roof. A distinctive feature of many houses in this area is the slightly curved form of their roof. This bowed form was considered to facilitate the shedding of snow, although roofs in most areas of the north have a simple slant or pitch. Whatever the origins, this unusual roof design provides an aesthetic quality of its own. The path to Solvychegodsk goes through the once-flourishing village of Tsivozero. Its brick Church of Sts. Peter and Paul, completed in the 1860s, was closed and despoiled in the Soviet area. Cleaned by local residents, the exterior of the church is appealing even with the ruined bell tower. Tsivozero's most remarkable monument, however, is the darkened form of a log bell tower. This intriguing structure was built in 1658 to accompany a church dedicated to Sts. Florus and Laurus. Although the church was frequently rebuilt and has long since disappeared, the intricate design of the bell tower provides a rare example of ancient traditions in log construction and decoration. And it is still on its original site. The way to Solvychegodsk passes through other villages, some of which have small wooden chapels as well as an occasional brick church (usually abandoned). None of this prepares for the stunning vision as the forest road opens to Solvychegodsk, at one time the center of the Stroganov "empire". Solvychegodsk means "salt of the Vychegda," and the area's salt springs produced great wealth in the 16th and 17th centuries. That wealth was reflected above all in two monuments built by the Stroganovs: the Cathedrals of the Annuciation (1560-84) and the elaborately decorated Cathedral of the Presentation (1688-93). The art and architecture created by the Stroganovs at Solvychegodsk is a topic unto itself. Nonetheless, seeing these magnificent structures among the villages of the Uftyuga area is a useful reminder of the juxtaposition of high artistic culture and traditional design in the Russian North.